1. Lately, fabric has been stacking up. That is why we’re having a fabric swap. 2. The goal for us is to entice you with getting rid of fabric you have never used in return for new fabric for your next projects. But actually, what we’d really like is for you to fill up a bag of fabric in exchange for $10. That way you don’t actually have to part with any of your coveted fabric stash. 3. There is a lot of quilting fabric. I have fabric on almost every free surface in the store. Some of this is holiday, and we’ll be putting that away until the right season rolls around. In addition to our seasonal fabric, if you don’t take this fabric home we’ll have to put most of this fabric into our warehouse. Which is sad, don’t make me do that. 4. This is happening starting today, Thursday, May 14 through next week Tuesday. After Tuesday our normal price on fabric will continue. Did you know that normally our fabric is priced by you? We’re the only store in town that allows customers to truly name their price for a product. 5. I’m not sure when this will be happening again. If this goes well, it’s something we could do quarterly, or more. To ensure this is successful for all of us, please let at least one person know about this who could benefit from getting some cheap fabric. Close your eyes and imagine the joy that person will receive from you telling them about all of the patterns and colors here at JAM’s Fabric Swap; share this post with the share buttons above or below. See you soon! Don’t forget, we’re closed Mondays! 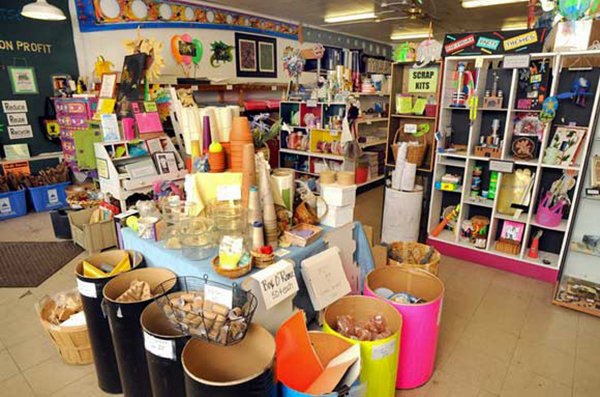 Did you know that there are over one hundred creative reuse centers in the United States? California has sixteen of them!